I had the opportunity to do a little field work, and came across a classic example of surface compaction. Please note, try as I might to get good images, the pictures just don’t adequately convey the concept. I’ll supplement the photos with textual description. I pulled a core with my push tube soil probe. The probe shows about 14″ of exposed core, and I used the knife to ‘pick’ at the core to show soil structure. The knife is placed at the breakpoint between surface compaction and structured soil. Above the knife, the soil structure is lacking with no clearly defined soil peds. Below the knife I can distinctly see peds that form medium to fine subangular blocks. Again, the difference was much more striking in person. 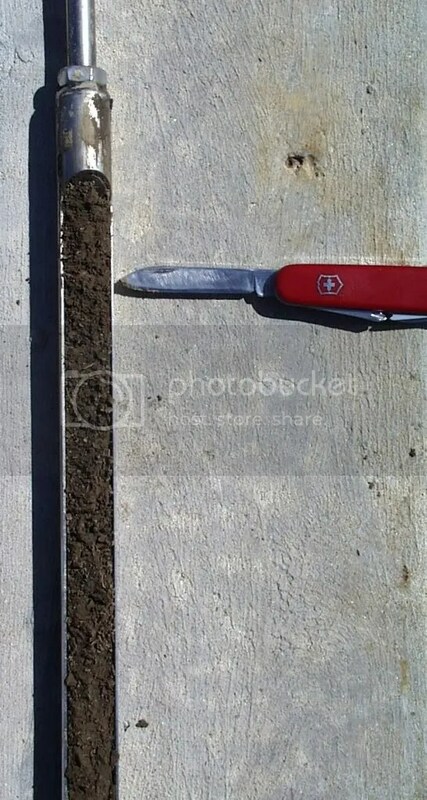 This is the same photo, but I’ve cropped the image to focus on the break in soil structure differences. Above the knife tip is structureless; below the knife is developed structure..
You’ll notice how well the surface horizon holds together when I try to form a ball; this is due to moisture remaining in the surface layer. The subsurface layer has a lower moisture content; notice how I cannot form as smooth of a ball without the soil crumbling. Implications? There are many implications, but most obvious is that the surface is retaining moisture, which may delay field work. Entry filed under: soil. Tags: soil compaction, soil density, soil structure.